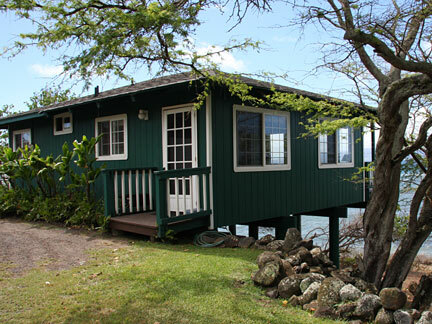 Pu'unana house sits on a low bluff and beach access is provided by a single flight of steps. Sleeps four comfortably with king bed in the master bedroom and 2 twin beds in the second bedroom. Safe swimming and snorkeling can be enjoyed year-round here or at other locations within a mile of the cottages. Located just past the 18 mile marker on Molokai's east end, this house offers easy access to the spectacular Halawa Valley with its waterfalls and scenic beauty. $210.00 per night plus 14.42% state tax. 50% deposit required at time of reservation. Balance due 60 days prior to arrival. Full deposit refund, less a $50.00 cancellation fee, on cancellations prior to 60 days of arrival. We accept personal checks. No credit cards, please.